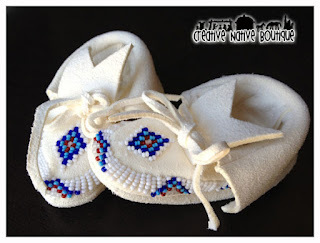 Baby boy fully-beaded moccasins. Size 3-ish. 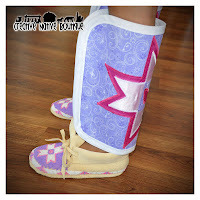 Shoshone design with custom colors. Sewn onto white deer hide. I made these purposely big, but included a "cinch-tie" around the ankle to ensure that they fit the little guy's feet;0) Now he can wear them a while longer. 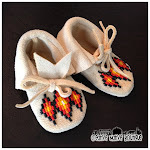 Newborn sized partially beaded baby moccasins on white deer hide. 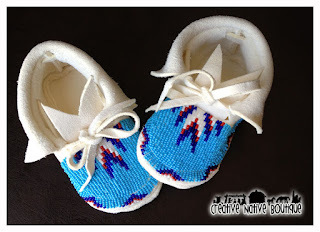 Cute for a baby boy or a girl!